Like Wednesday’s, the winter solstice is that hump day that makes the winter bearable. It’s the metaphorical permission you need to embrace winter because you know that summer is on its way once again. As if to celebrate midwinter, nature threw New Zealand it’s finest blanket of snow, strongest winds and enough rain to make up for the parched summer we had this year. Thankfully we’ve stayed warm, dry and safe indoors with the only bone of contention being who will replenish the log or whether the bassets or I would get the closest to the fire. It may be frosty out but in the kitchen we’re embracing the comfort food of winter. Casseroles, soups and plenty of warm fruit. For the first time ever this year I’ve become partial to a Persimmons. At first glance you’d be fooled that they were tomatoes and you can slice them and eat them as if they were. I however prefer them roasted or stewed and I have grand plans for sneaking them into breakfast muffins. Although I’m rather taken with the prospect of a persimmon, fennel and rocket salad from the lovely Emma aka Darling Lemon Thyme who has just sent her first cookbook manuscript to the publisher after much hard work. Just writing a few thousand words for an essay feels a Herculean effort to me so I am full of admiration of people who take on a book writing challenge. It’s been so hard to keep up with reading for the course, research and writing the assignments as well as keeping up with my own blog. I always knew it would be hard but I didn’t know how guilty I would feel about blogging so infrequently. I have some breathing space before my next essay is due I shall try and get back into the writing habit and publish at least two blog posts a week. Having just returned from an overnight trip to the first Martinborough Olive Oil Festival I do at least have material for my next blog post up my sleeve. As well as getting a master class in olive oil tasting we saw olive harvesting and learned all about how they press the oil. Much to our surprise also we met someone who was bringing their olives in to press and they live close to Wellington where this is a similar climate to where we live so needless to say we’re inspired to see if we can source a suitable variety to plant a few trees of our own. I think they’ll be a perfect addition to our backyard pantry. 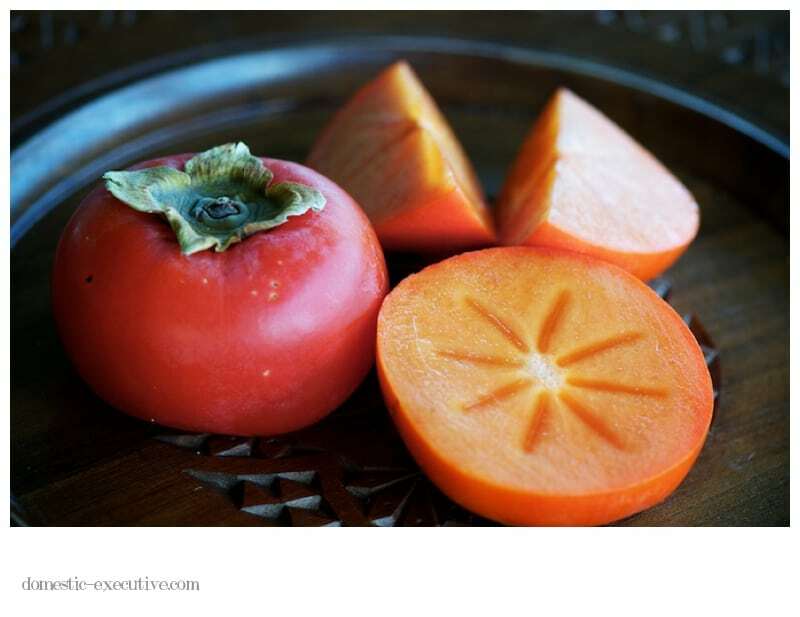 I’ve never tried a persimmon, we get them occasionally in the market, very seasonal like pomegranites. What are they like? Sweet? Tart? What is the texture comparitive too? I think I need to try one next time I see them. Also, what’s a rocket? To us, a rocket is something you shoot up into space, apparently you eat them tho LOL? As for olives, that would be very interesting to grow your own, I never thought about that, it’s not something most people plant in the backyard you know? I prefer to nibble on the black ones, never did care for the green ones but I’m not sure if they’re different varieties or if the black ones are just more ripe, also not sure which ones are pressed for oil. I do know that “extra” virgin oil is the first pressing and the finest, tastiest and preferred oil over later pressings. You’ll have to let me know how this endeavor turns out. As for the weather, enjoy it while it lasts, I know that I could use a few chilly days about now as we are just coming in to the heat of summer and it’s only going to get worse. The other day I stepped outside to go check the mail and the humidity literally took my breath away!! Right back into the air conditioned comfort I went. All my bills I get on-line anyway, so nothing all that pressing in that little mailbox anyway 😉 Give the lads a kiss from me!! Persimmon are a little sweet and a little tart when perfectly ripe. Give them a go. I could do with some of your heat as we’re buffetted in cold winds but it’s only a matter of time before it gets better here. I shall do a post about the olive oil which was fascinating. I know what you mean about hump day, I have come not to like June too much, but as soon as that shortest day is over I am fine again….roll on Spring & Summer!